Backpacker Panda has set up shop on the bustling 12th A Main of Indiranagar, and it’s got to be the prime spot for partying, chilling and then sleeping! We originally said out of town friends, but we also mean those who live in Sarjapur, Mysore Road and Yelahanka. On a weekend, those localities count as ‘Not Bangalore’! Especially if you’re planning to rave it at Indiranagar. 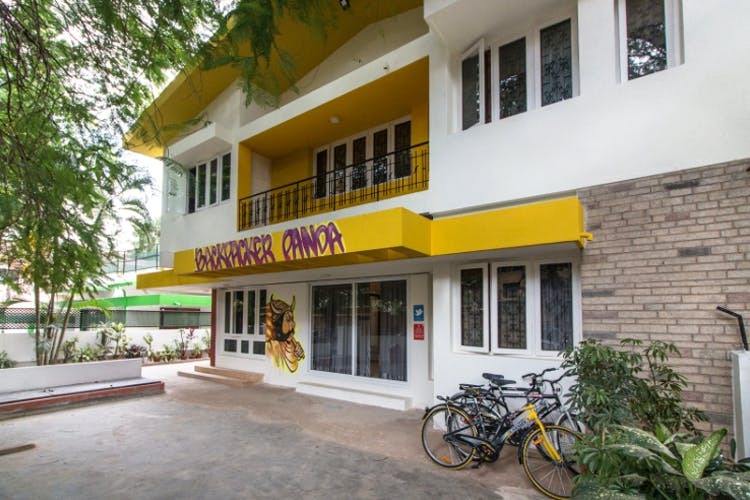 For those legit travellers and Bangalore ones too, Backpacker Panda’s new place on the quieter 12th A Main in Indiranagar, is a dream come true. Set in a charming, revamped bungalow, it’s like a slice of Goa in town. Think bright yellow paint, murals on the walls in the lounge area and guests milling around in pajamas, sharing stories of their lives… see you want to check in already, no? The space is a typical Bangalore home, so expect airy private rooms if you want to cosy up with bae or BFF. We’d pick the neat dorm rooms however. What’s a hostel experience without sleeping on a bunk bed, eh? There are four bed mixed dorms, and for the ladies who’d rather bunk with other ladies, there’s a female-only dorm as well, with space for 6 and an en suite bathroom. Perfect for backpackers and party goers! There’s a mini kitchenette equipped with a fridge, microwave and a kettle. In the middle of Indiranagar’s buzzing food and drink scene however, we highly doubt you’ll need that. Unless it’s to store your indulgent Corner House ice cream which you couldn’t earlier finish. If you’re looking to make it a pub/restaurant crawl on the (in)famous 12th Main, check out our suggestions here. So, you can see why we may just make this our weekend hangout! It's the perfect place to stay where all the action is.